Kicking off an extravehicular activity (EVA) at FMARS. 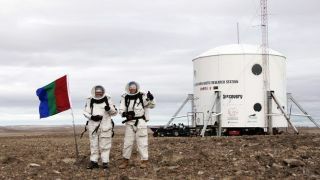 Although our mission started on June 22 when we arrived in Yellowknife and began making final preparations for our simulation in the arctic, we didn't begin the second half of our Mars mission simulation until July 20 due to the weather. In spite of this delay, the crew has been making up for lost time and catching up on research projects delayed by our late arrival. The first two extravehicular activities (EVAs) that we conducted were "in-sim," which means they were conducted under full Mars mission simulation constraints, including donning a spacesuit and waiting for our airlock to depressurize before going outside. The spacesuits limit our mobility and make normal tasks such as opening a sample bag or operating a hand tool much more of a challenge. Astronauts training for EVAs on the space station and, in the future, for surface exploration of Mars will have to confront these challenges. However, we are also not on Mars — we don't face deadly depressurization and cold on the other side of our helmets. We are sitting on the rim of an ancient impact crater that is home to geological and biological processes that make for interesting points of Mars analog study beyond the context of our simulated Mars mission. So, if we are facing inclement weather or activities that might be dangerous or inhibited as a result of wearing spacesuits, we conduct so-called "out-of-sim" EVAs in normal cold-weather gear suitable for the arctic summer. These EVAs are noted and factor into the overall science productivity of the mission by comparing in-sim and out-of-sim activities. A Mars 160 crew member searches a hillside on an EVA. As a result of rain that limits our visibility while wearing our helmets, many of our EVAs over the past week have been conducted out-of-sim. Despite this deviation from normal simulation conditions, it has not spoiled the spirit of the mission. None of us have ever been to Devon Island or this far north in the arctic, so even though not conducted under simulation constraints, these scouting EVAs are the essence of true exploration. Walking over every hill reveals a landscape seen by few and often raises more questions about this exotic area than it provides answers. Astronauts on Mars will face a similar dilemma, and this scouting process is ultimately what drives exploration forward. With so much area to explore, how do we choose which targets are the most scientifically valuable, and how do we prioritize them against each other? These are topics of conversation on a daily basis at FMARS during our daily briefings. Heading home after a lengthy EVA. Shortly after lunch, Yusuke Murakami broke out a box of Origami paper with national flags printed on each sheet. Yusuke is a jack of all trades who has spent time in extreme places, including Antarctica and the Mount Everest Base Camp, and has been quick to teach us all new skills. Whether it was how to tie different knots while we waited in Resolute or how to make paper swans on a rainy Saturday, there has been no shortage of activity ideas from him. Anastasiya Stepanova, our Russian crewmate, found a bread maker in the attic of FMARS and promptly went to work baking our first loaf of "Martian bread." During both halves of the mission here and at MDRS, the smell of bread and the feeling of community that forms around the table as fresh bread is broken quickly lift the spirits of the crew. Once a fresh loaf is ready, we often sit around the table drinking coffee and tea, swapping stories about our lives back home and of course talking of our common area of interest: Mars. Members of the Mars 160 crew celebrate the birthday of Yusuke Murakami inside the FMARS hab. Being away from home for as long as we have also means celebrating some holidays and birthdays over the course of our mission. While we were waiting in Resolute, we marked Canada Day by joining the local parade through town, and just a few days later I marked the 4th of July under snowy skies from our remote hotel. We will have two birthdays to mark at FMARS — Yusuke's and my own. Yusuke's was on Monday and, since this was his first Martian birthday, we made sure that we celebrated his true age in Mars years, with each Mars year making for about two Earth years. Using this math, he is celebrating his 19th birthday and I will be celebrating my 14th! So how does one celebrate a birthday on Mars? It is a mix of good-natured humor and making the most of what you have available. For Yusuke's birthday, a toy water gun was found in the attic, left from a previous mission, and given to him as a gift from the entire crew. A large birthday dinner of cabanera was cooked up using available ingredients by our French commander, Alexandre Mangeot. The birthday desert was kulfi, a traditional Indian dish which was prepared by Anushree Srivastava, our crewmate from India. The evening was spent around the table, laughing and eating as we have become accustomed to on our journey. We have about three and a half more weeks left in our mission to Mars on Earth here in the Canadian arctic. The forecast is calling for more rain and snow in the coming days, but we are making the most of the situation and gathering as much field data as we can for our respective analog research projects. Despite the dreary weather, there is never a dull moment around the station and the crew remains in good spirits.